After the passing of J. Oliver Jackson, I looked into my archives to find some videos of Bobby Morrow, the 100m, 200m 4x100m 1956 Olympic Gold Medalist in Melbourne, Australia. Morrow also was a sprinter at Abilene Christian University. The 4×100 meter was a world record. He retired in 1958, made a short comeback before the 1960 Olympics, but he failed to qualify for the Olympic team. David Sime, who missed the 1956 Olympics due to injury would have to battle it out with Armin Hary of Germany in the 1960 Olympic Games. 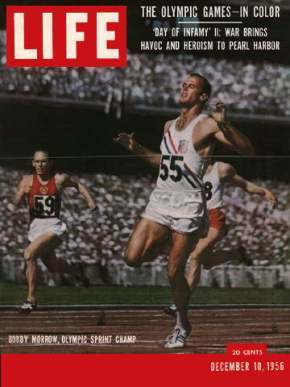 This was the first time the Games were televised in color as displayed on the Life magazine cover (left). Did you notice from the video footage only 6 lanes were used, instead of today’s 8 or 9 lanes? The stadium capacity was over 120,000 so I can only assume this stadium was a converted cricket field. If anyone knows the answer to this trivia question, please add to the comment below as I would like to know. You can download the video here (warning: this file is over 100 Megabytes), or click on the video below. That footage brings me back to 6 or 7 years ago. I bought broadcast quality copies of this footage from the Olympic Committee for a project I was working on. Cool footage. @OMC – I actually own that copy of Life magazine in average condition. What’s it worth? the 1956 games were held in an australian rules football stadium which is an egg shaped fully grassed arena and measures approximately 170m x 120m. In its current configuration it seats 100,000. In 1956 there was a lot of standing room which has largely been eliminated. The ground is also used for major cricket matches. THANK YOU VERY MUCH FOR SHOWING MY VIDEO. I HAD A GREAT TIME IN DOING IT. Juan Flores Des moines Ia. I was there as an Aussie teenage who loved sport. I can still rattle off the names of Bobby’ s competitors and colleagues. Altho Australia was an athletic minnow, our Hec Hogan ran 9.3 and got a bronze in the 100. The high jump was also an exciting compettion between USA Charlie Dumas and AUS Chilla Porter. Aussie women cleaned up in the sprints. I was also at the ground with 135,000 who heard Billy Graham preach in 1959. While the day over 90,000 went to see the West Indies Cricket team compete against Australia in 1960/1, I had had great day. Yes Aussie rules is played before huge crowds. The toughest fastest football game on earth and like so much in sport great to watch and play. @Juan & Graeme – Thanks for sharing! I wrote sports illustrated several years ago, someone had mentioned that america did not have many white sprinters. I was 16 years old when I first heard of Bobby Morrow, and Dave Sime. If I remember Sime was a baseball player turned sprinter. One of the great disappointments of my life was when Sime got hurt and did not make the 1956 olympic team. I still have many articles about these two great sprinters. I wonder what they would have run on these tracks now. @Charles – I think Sime is more disappointed with the 4x100m relay DQ. I don’t know how those guys (Moreow and Sime) could run 10.2 on cinders. 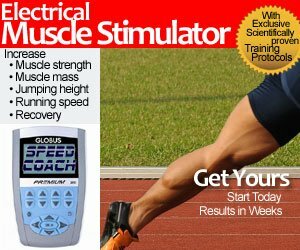 My best time was 11.3 and I could beat many people. Bobby Morrow was my hero and there are many questions I would like to ask him. I love track and field. I have read every article I could locate regarding Bobby. Is there a book I could order? @marlin jones – my attempts in contacting Bobby Morrow were unsuccessful. Perhaps Dave Sime would know? or send him an email, it would be great. I love track and field. Bobby Morrow and Dave Sime are two guys that I really admire and had super talent. go below 10.0 in the 100 Meters not too long ago.